Isn’t it something that we all want from one another? Isn’t it something that most of us strive to do towards those around us? I know I do and yet I also know that while most of us never ever want to disrespect anyone or anything in this world, none of us have walked this road perfectly. But we are hopefully growing. Growing every moment, not only because we want to but because if we pay attention, we can see the frustrations and even the sadness that comes when one feels disrespected and our hearts tell us that we need to find another way of communicating. 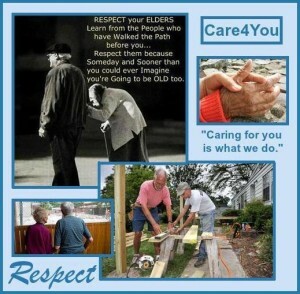 Our work here at Care4You is a joy to do. We get to walk alongside our clients as they allow us into their private lives in an effort to help them continue living theirs in the best way possible. And we all know that respect has to be there in our efforts to relate together. Consider this…Through the years, Dad has always been the one to fix everything around the home. Things inside the house, outside the house and even the cars. He is well verse and quite the expert and he is truly dependable. But that time may come when he is no longer able to handle those ‘fixes’ alone and he finds himself needing to call on the expertise of another. Sometimes a professional, sometimes a family member, a neighbor or a good friend. He knows how something should be done and done right. Yet what worked in the days gone by and maybe even with years of experience in a trade once had, sometimes there are changes in how those things are done now. New discoveries are sometimes made where the fix may be better than what was done in the past. Progress can be good! So then, how do we help our loved ones recognize that sometimes changes in the fix may be done in a way that’s new? How do we do that respectfully? Unfortunately there is also a way to fix something and it’s done by cutting corners and then the quality becomes lax and Dad is not a happy camper. Well maybe true but the response of the professional leaves Dad with a feeling his concerns are not being validated nor respected.That’s not good nor is it a way to bring understanding. So how do we help those who are professionals, realize that their clients need to be respected, that they need to be listened to? And what if shortcuts that are taken by a professional produce shoddy and unsafe results, then this is definitely unacceptable and the need for the quality takes precedence and an understanding between the two parties has to be reached. It takes patience. It takes talking things out together and hopefully an understanding can be reached along with a plan of action that will be fully acceptable to the client. With Care4You, we recognize this as we respect what our clients desire. It takes a bond between the caregiver and the care receiver, a trust if you will, that once established is priceless. This can be done in any situation presented that involves two parties. Both can speak freely and know that the other is listening and validating feelings expressed and the two can move forward and get what needs done, done to the satisfaction of both and especially the client. This is something that can be found with Care4You and our clients and it’s a very good place to be for both of us as one of our desires is to help those entrusted to our care, receive one of the most treasured gifts we can give them…. They have given us so much during our lives. Can we do no less for them at this time of theirs? Here we are halfway through February and I can remember, as if it were yesterday, the years when I was a caregiver for my parents. It was a time of true dedication in the hopes of doing all that I could to help them during that time. I, like so many of you who have been or are caregivers now, move forward each day with a heart to serve in caring for loved ones in need. We don’t think about how we will be tested in our abilities and our endurance. We just do what we have to do because this time in our lives is about them, these very dear people who at the moment are in need of our help! How many of us have been looking for assistance from wonderful caregiving companies out there? Companies who are just as dedicated in helping our seniors as we are as family members and friends. I must confess that at the time of my life when I was caring for my parents, I didn’t even think about who was available to help me. I was so focused on what I was doing that I didn’t see who was so close by, ready to help my parents and in turn be there for me, also! Like the picture below that is done with a slight sense of humor, it does make a point that sometimes what we are searching for is just there waiting for us to look in the right direction. I will never, ever regret being there for my parents, yet knowing what I know today, I would not hesitate to make that call and ask for assistance that would have benefited both my parents and myself. Meeting Donna Hoover, learning how professional and caring she is and the fine example she sets for not only her staff and caregivers but also for the community, I would have had no difficulty in choosing Care4You to help me with my parents. The comments I have personally heard from both clients and families have been really positive, as people seem to be very happy with the professional and caring manner of everyone at Care4You. The confidence and trust is a major plus for this dedicated company! 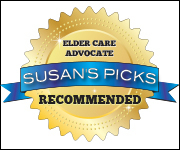 Care4You is now officially recognized as and approved by top elder expert and advocate Susan B. Geffen as a company you can trust and has received her special seal of approval, ‘Susan’s Picks,’ which you will also find on our website. Yes, I do look back and honestly wish I would have looked into well run home care services in our community. That would have been time well spent and definitely worth every step of the way for my parents and for myself! So please don’t hesitate to see who’s out there as ‘recommended’ caregiving companies in your area. Companies who are willing and very capable in helping you care for your loved ones. Who knows…they may be closer than you think. They may be right around the corner! Today was a very sad, somber day at Care4You. We have lost a special lady; she has entered into rest. 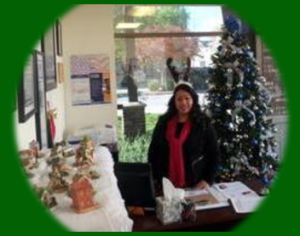 Our client since 2003, she was near and dear to us as she touched all of our hearts! Because she had no family, we became her family and her caregiver of 10 years developed a rapport like no other. Although we have lost her, we are consoled knowing that heaven has gained a precious soul. May she rest in peace. “I am standing by the seashore. of living freight to the places of destination. Lilacs & Greensleeves: Setting the Example! Looking back over the years of my life, I’ve come to realize how many good examples my parents have set for me. I take those memories with me wherever I go and every so often they surface and I can’t help but smile and yes, sometimes I even cry, when I think of them. Of all the examples that they have set for me, there is one that really stands out. I saw Dad’s love for Mom throughout the years but it was never more evident to me than when Mom had Post Infarct Dementia. Here was this dear independant woman who, through the years following her diagnosis, had become more and more dependant on the people who loved her. And we were there for her! Each of us contributing in the best way that we could to help Mom through this time in her life. Yes, through my eyes, that was Dad! He set the example and I hold that memory along with so many others both he and Mom set, very close to my heart. Working with our clients at Care4You, we meet couples who are walking in that same devotion! And when there is only one spouse left to carry on, we hear stories from them and their family and friends who tell of years of loving, caring and staying the course, through it all. Just like this dear man George with his beloved Adriana, told through the eyes of their loving son, Marco. 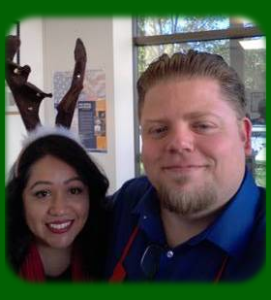 Thank you George and Adriana, for setting such a wonderful example for all of us! Showing appreciation to those who walk alongside you, never happens without positive repercussions. We would like to take a moment here during the end of 2013 and thank every one of you who have helped to make our work here at Care4You easier in our dedication to serve all of our wonderful clients throughout the year. Please know that we appreciate all of you! Our annual Christmas Party was a joy, celebrating this season with clients, caregivers, staff and friends of Care4You! 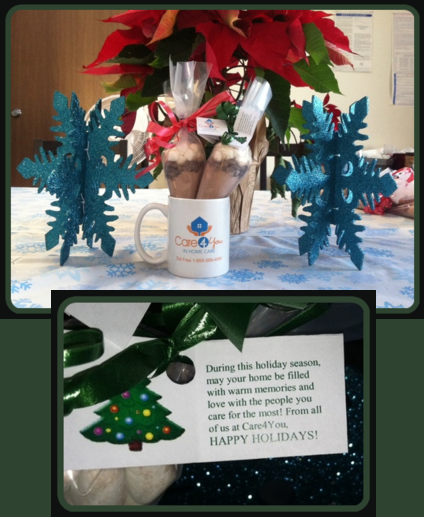 And three of our employees…Gaby, Vanessa and Shane worked together to create delicious Hot Chocolate gift mugs for our Joe Hoover to give out to his referral sources at Care4You! May your days of doubt be replaced with days of hope and cheer. And may you and your family get nurtured with lots of love! Spread the warmth of the Christmas season to all those around you. And make this world a beautiful place to live in. From all of us at Care4You! The Holidays are upon us. Can you feel it? The stores are filled with shoppers making sure that everyone on their list is covered. There is music in the air and people are planning their travels and events that will take them straight through to the new year. 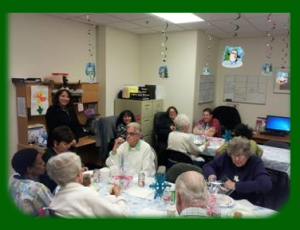 There are Christmas parties joining people together in fun and good cheer. Love is personified as we remember all the blessings that we have in our lives. We reach out to those in need and we give of ourselves personally and financially and hearts are touched in the process. I remember when I was a caregiver for my Mom and Dad. Mom’s brother, Uncle Tommy was her only remaining sibling and he loved my Mom so very much! He expressed such appreciation to me for caring for his sister. But he didn’t stop there. He stepped right up to the plate and became a part of the caregiver team. Uncle Tommy would call on the phone. He would come to our home and visit. He would also encourage me in everything I was doing to care for my Mom. He would even take Dad to the barbershop for a haircut every month. And even when he was suffering with Mesothelioma (Asbestos Lung Disease) and had to use portable oxygen every day, his involvement in Mom and Dad’s care was a constant and for us, priceless! Uncle Tommy loved music and as a little boy, Mom would see him pull the pots and pans out from under the sink as he sat on the kitchen floor beating those pots like a full set of drums. She often spoke of buying Uncle Tommy a little Hummel Drummer Boy figurine as a reminder to him of those wonderful times when in his own way, he poured out his little heart into his gift as he played his very best for her. The Drummer Boy! The young one who in honor of the King, played ‘his’ very best. How appropriate those words apply to my dear uncle and to all those who give their best to their families, friends and yes the caregivers, who are walking a road that at times can be very difficult. This is something that Care4You recognizes in our clients’ family and friends who also become a part of the team in caregiving for their loved ones. We really appreciate, admire and respect those who work alongside us as caregivers, giving us all the support that they can while trying to manage their own lives on a day to day basis. So in my appreciation to my Uncle Tommy for his faithfulness and devotion to my Mom and to all those who show their love and dedication in giving their best in honoring their loved ones…this is for you, for this very special Season and beyond! Ahhhh…here it is again. The Holidays are upon us! The older I get the faster the days go by. Do you find that too? I have to tell you that I love this time of year! I am an Autumn girl and having grown up in Pennsylvania, I find myself really enjoying this time of year! The colors of the trees, football games every week, the smell of wood burning in the fireplace, the crisp Fall air, homey meals cooking on the stove and in the oven. Oh my, I am closing my eyes as I take a deep breath and allow my mind to wander! Speaking of all of those wonderful things about Autumn, I will tell you that Thanksgiving is one of my favorite holidays. There is so much to be thankful for in my life. My faith, the blessings that I have found working for Donna and Bill Hoover at Care4You, good family and friends, a country that I love and being able to give to those in need. Those are just a few of the reasons that I have to be thankful for and I truly am! Be thankful for the lady who sings off-key behind you in church, because it means you can hear. Yes, I can be thankful for all of these things and more. Yet I know that for many this time of year, it can be difficult to feel that thankfulness, that joy. So what do we do? How do we support our seniors when they may be feeling so sad? Feelings of depression can be something that may need the attention of the family doctor so I think we should be discerning and recommend that a visit to their primary doctor just may be necessary. For us as caregivers, validating their feelings is up there at the top of the list. Would we want anyone telling us that something we’re feeling is not legitimate? Another thing I personally try to do is lead with short and simple questions that enable our clients to talk about their thoughts and their feelings, if they so choose. They may show all kinds of emotion and it’s ok to cry and even be angry at the unfairness of loved ones gone on or the good old days not being there anymore. They may be upset at children, grandchildren and friends who don’t keep in touch anymore. After validating and talking with those who are feeling the blues, I think the next thing is to find a way to help our seniors focus outward. Maybe inviting them to your celebration of the holidays as Care4You does each year or maybe spending part of your holiday with them should they be unable to leave their home. Well, we need to find out what they are capable of doing. Some of our seniors may not be able to contribute money or they may not be able to address envelopes for the cards because their handwriting is not as good as it used to be but they can put stamps and address labels on all those envelopes. Simple? Sure, but oh that wonderful feeling of being a team player! You just can’t beat it! 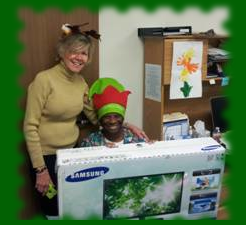 What else can our seniors do to feel good about being a part of this holiday season? Helping to make a batch of cookies. Stuffing envelopes with the cards or newsletter updates. Taking them to the mall for Christmas shopping. Helping to decorate your tree. Helping them to decorate their tree and their home if they want to. Wrapping presents for special charities. Finding out the seniors favorite recipes and asking them to supervise or even help you make them and then at your dinner, acknowledge them in their contribution. 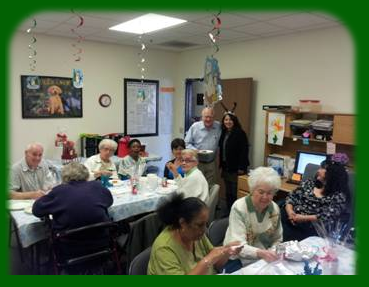 With their permission, take them to the Senior Centers during the holidays where they may find some new friends. Please share with us your suggestions and let us all do what we can to care for our seniors, right through the holidays and beyond! 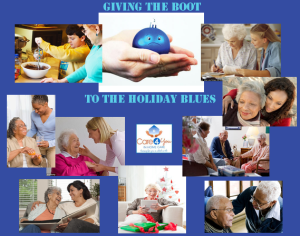 Let’s ‘give’ the boot to the Holiday Blues! What a beautiful combination! Can you imagine the joy that goes on between the young and the old when they connect? I remember clearly my relationship with my grandmother. All through my childhood she was there in one way or another in my little life. She would send me cards for my birthdays and letters that always ended, “Love and Prayers!” During the summer months, my sisters and I would spend our whole vacation with her. She always made something special for us. She must have spent hours in the kitchen creating her famous Raisin-filled cookies where she would then fill an empty Charles Chips can all the way to the top with those wonderful delicasies! Just one of many loving memories, for sure! I think that children play a very important part in their grandparents lives, too. The excitement of youth, the joy of the ‘play!’ Together they bring a strong emotional bond that has the possibilities of lasting forever. I believe that caring grandparents can provide their grandchildren with a sense of history, of culteral pride and also protection and safety. Today when the world can seem like a very scary place sometimes, grandparents can be a real comfort to their grandchildren!! Don’t you think that children brought up in the company of our elderly where they are taught to respect, speak kindness, give compassion and understanding, makes a difference in their lives? I do. And these are the ones who one day may be a part of determining how our elderly are treated and cared for, from teaching their own children to voting on legislation in our government. I recently heard of a story about a child who was left to run rampant around a food market while their parent shopped. This child ran into an elderly woman, knocked her to the floor where she broke her hip. As the story is told, the elderly woman saw a hand reach down to her or so she thought but as it turned out, it was the child’s mother who was reaching for the child to quickly get her out of the store, leaving the woman on the floor in pain. I grieve at the thought of this as I have been told by seniors themselves how fearful they are of falling. I wonder what that little child took from that experience and what she felt as her mother pulled her away from the dear woman she knocked to the floor. The foundation of disrespect can start in childhood. I am hoping beyond all hope that someone will come into this child’s life and show her the value of our wonderful elderly population and she will remember her behavior in the store and feel remorse. Care4You is aware of the fears of falling among our seniors and we strive to walk beside them to protect them as we care for this beautiful generation. I believe that we all need to be aware of this concern among our elderly and do everything we can to protect them, in their home and when they are out and about.